FAQ: What Power Wheelchars Are Compatible With Dynamic Seating? Ted Ruckstuhl is the Business Development Manager at Seating Dynamics. You may have spoken to him on the phone, he provides quite a bit of support to customers that way. One question he is asked frequently is whether Dynamic Seating can be used on a power wheelchair. Dynamic Seating can indeed be used on power wheelchairs. 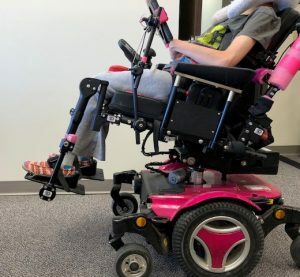 This leads to two other questions: 1) what power wheelchairs are compatible with Dynamic Seating, and 2) what are the clinical indicators and contra-indicators for using this technology on a power wheelchair? We addressed the second question in this blog. What power wheelchairs are compatible with Dynamic Seating? Note 1: the DRBi is not compatible with any reclining back. Note 2: the Seating Dynamics Footrests are not compatible with center mount or elevating footrest hangers. Finally, the Dynamic Head Support Hardware is compatible with any power wheelchair. Dynamic Seating works very well on many power wheelchairs. If you are unsure about compatibility, or you don’t see what you need, please contact us for more help at 303-986-9300 or Ted@atrmfg.co. Seating Dynamics is continually working to expand our list of compatible mobility bases.